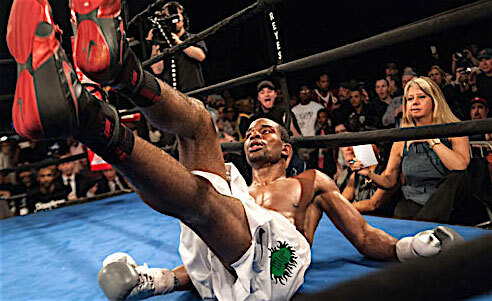 Tough fighting by Escondido's Dashon "Fly Boy" Johnson has earned him respect on the East Coast boxing circuit. 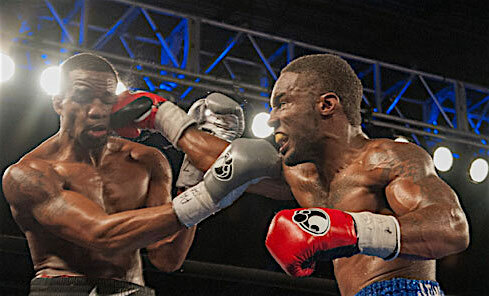 Escondido’s Dashon “Fly Boy” Johnson finds himself in another Philly main event, and is arguably even the star of the show. The promotion has been dubbed “He’s Backkkkk!”, and the promoters (Peltz, Hand and BAM) hope that Johnson has as much resilience as Jason Voorhees did in the Friday the 13th movies. 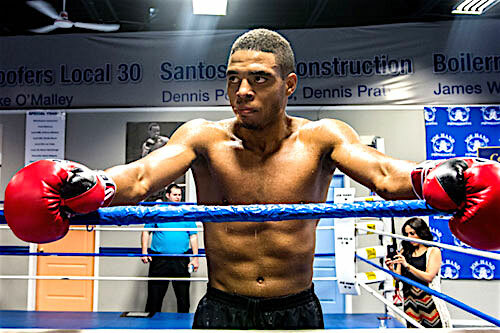 Philadelphia’s summer boxing season kicks off Friday night in South Philly at the 2300 Arena with an interesting main event between Atlantic City’s DeCarlo Perez and Escondido’s Dashon “Fly Boy” Johnson. The 10-round above-the-limit middleweight contest pairs two boxers familiar to local fight fans. One has been under our noses for years, while the other jumped onto our radar after a glorious losing effort against Jesse Hart in March. Friday the fighters will collide with both their careers on the line. Johnson, 20-19-3, 6 KOs, is a tough road warrior. He has fought primarily on the West Coast, but has visited our side of the country a handful of times. In March, Johnson made one of those trips east and did his best to put an end to the undefeated streak of favorite Philly son Jesse “Hard Work” Hart. Hart won a comfortable decision that night, but not before pulling himself off the canvas twice (only one was called a knockdown), and being tested like never before. Johnson was the culprit who nearly derailed the star prospect, and ever since that night, many observers even question Hart’s true potential. Fly Boy gives it to Jesse “Hard Work” Hart at South Philly in March. It was a great night for Johnson, despite only winning two rounds. But this is what he does. He steps into the ring against any opponent between 154 and 168 pounds, and fights. He is a durable pro who can mix it up against anyone. Over the years, he’s faced Jermell Charlo, Glen Tapia, Joshua Clottey, Sergio Mora, and Philly’s Julian Williams. His performance against Hart had promoter J Russell Peltz hungry to stage a rematch between the two at a bigger Philadelphia venue. However in the modern version of the sport, rematches on the way up rarely happen, especially when the favorite comes away with the win. So guys like Johnson just have to seek new opportunities to upset the apple cart. Liking what he saw in Johnson, Peltz insisted on bringing him back to the City of Brotherly Love for another go, even if it couldn’t be against Hart. Peltz has done this numerous times before, and even built Philly-based careers for out-of-towners, back in the glory days. Names like Marvin Johnson and Prince Charles Williams come immediately to mind. 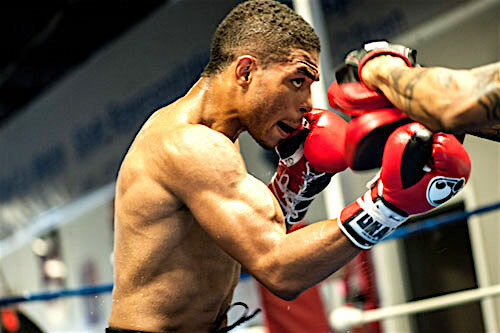 The search for a suitable opponent for Johnson ended with DeCarlo Perez, 15-4-1, 5 KOs. Perez has fought most of his career in the region, especially in Philly and Atlantic City, and has built a reputation for crowd-pleasing fights. Last year, Perez, a former pharmacy technician now 100% focused on his boxing career, appeared to reach a new level in the ring – first locally, against Tyrone Brunson and Jesse Nicklow, then nationally, with a career-best victory over a 23-0 Juan Ubaldo Cabrera on Showtime. Perez prevailed in the grueling fight with a fifth round TKO. Perez won a 10-round unanimous decision and was on a significant career roll. However, he then lost a January bout on Showtime with undefeated prospect Rob Brant. That loss, and a few others that he’s suffered, hint that Perez might not be a world class middleweight, but the jury is still out on that. In any case, Perez is at the crossroads after losing to Brant, and has no easy assignment against Johnson. On the flipside, Johnson, whose career is perpetually at the crossroads, also badly needs the win. Usually this mutual need makes for a good fight. Perez has spent most of this training camp in the Philly gyms. Hart dropped by Johnson in their bout. Perez missed Johnson’s fight with Hart, but managed to still do his homework for their fight. Most would rate Hart a level above Perez. However, DeCarlo is probably a better at infighting than Hart, and he sees that his biggest advantage against Johnson. A victory over Johnson is exactly what Perez needs. A second straight loss would quickly take his career out of neutral and put it into reverse in a hurry. Johnson is a guy that you are supposed to beat, even if you have to struggle to do it. Perez needs to bring this victory home. With this personal incentive, and all his hard work leading up to the fight, Perez sounds ready. It’s a simple plan and one that Perez believes in. On Friday, Perez will get his answer. Despite not burning up the box office like Hart-Johnson (which was Philly’s fastest selling boxing ticket in years), Johnson vs. Perez appears to be another excellent match up that should produce a memorable fight. As is usually the case with a Peltz/Hand/BAM promotion, this should be a fight worth watching. Seven additional bouts round out the card, including starts by local prospects Jaron Ennis, Jerome Conquest, Jaba Khositashvili, Steven Ortiz, and Isaiah Wise. The first bell rings at 7:00 PM. Tickets are still available. Published Wednesday, June 1, reprinted by permission. John DiSanto has made it his mission to present and preserve Philadelphia boxing history . He also covers the current boxing scene. To read more about the Philly fight scene – past and present – visit www.phillyboxinghistory.com. Be the first to comment on "Perez to test Dashon ‘Fly Boy’ Johnson"